Check out Tobi's Show Off Shoulder Sweater Dress Show up and show off with the Marsala Show Off Shoulder Sweater Dress. 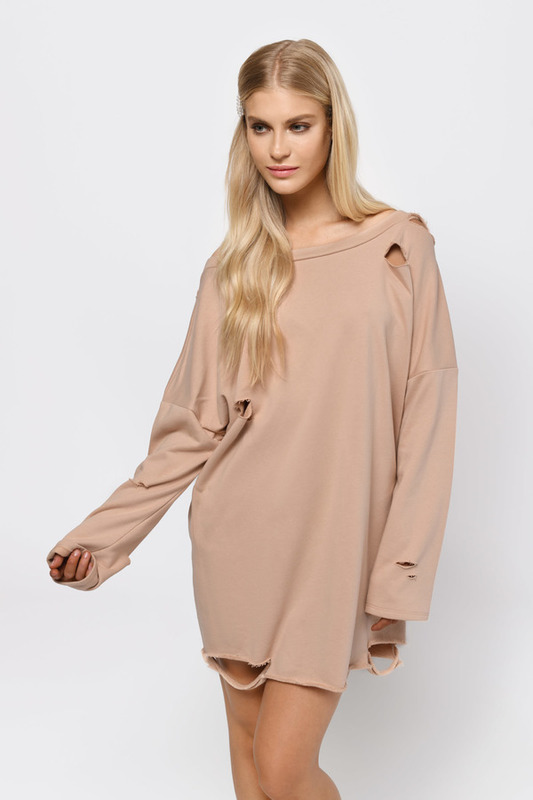 Designed to slip gently off the shoulder, this sweatshirt dress has been slashed and ripped to perfection, with a raw hem to finish it off. Pair this distressed dress with booties. Show up and show off with the Marsala Show Off Shoulder Sweater Dress. Designed to slip gently off the shoulder, this sweatshirt dress has been slashed and ripped to perfection, with a raw hem to finish it off. Pair this distressed dress with booties. Show up and show off with the Natural Show Off Shoulder Sweater Dress. Designed to slip gently off the shoulder, this sweatshirt dress has been slashed and ripped to perfection, with a raw hem to finish it off. Pair this distressed dress with booties. Show up and show off with the Black Show Off Shoulder Sweater Dress. Designed to slip gently off the shoulder, this sweatshirt dress has been slashed and ripped to perfection, with a raw hem to finish it off. Pair this distressed dress with booties. Black, Marsala, Natural modeled on a size Small. Natural modeled on a size Small.